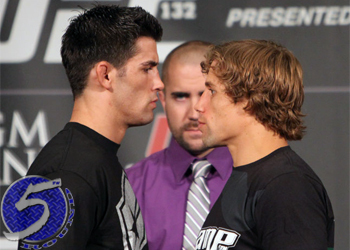 During Friday’s “UFC Unstoppable” press conference in Las Vegas, it was announced a trilogy between bantamweight champion Dominick Cruz and bitter rival Urijah Faber will co-headline UFC 199. The event takes place June 4 at the Forum in Inglewood, California, former home of the “Showtime” Lakers. The show’s featured attraction is a rematch between middleweight champ Luke Rockhold and Chris Weidman. Faber handed Cruz the only loss of his professional career by submitting him to retain his WEC featherweight strap in 2007. Cruz knotted up the score four years later with a controversial unanimous decision win to keep his UFC bantamweight gold. Six of Faber’s last seven losses have come in title tilts. “The California Kid” hasn’t won a championship affair since defending his WEC featherweight belt against Jens Pulver in 2008. Faber was last seen outpointing Frankie Saenz in December. Cruz, meanwhile, returned from yet another long injury-plagued layoff in January to reclaim the bantamweight championship from TJ Dillashaw. Due to various injuries, Cruz has only performed three times since 2011, which forced the UFC to strip him of his hardware in 2014.